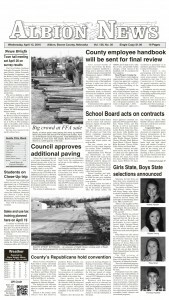 Demolition work at the Boone Central Schools elementary wing last week. Work is continuing at many locations on the Boone Central construction project, with both demolition and new construction underway last week. 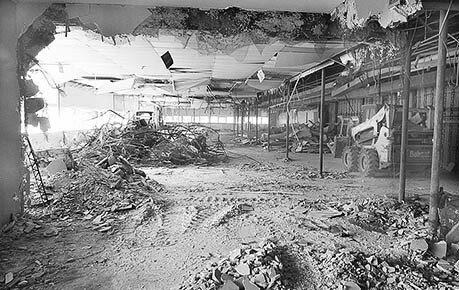 In the 1956 elementary school wing, a complete demolition of the interior (above photo) was being completed last week. All furniture and supplies had been removed and stored. The interior of this wing will be entirely rebuilt through the summer months. School staff will be moving all furniture and supplies back into the building for the start of school next fall. At the same time, progress is evident on the new construction portion of the projects, on the east and south sides of the high school. The new main entrance doors (lower photo) were being installed last week. 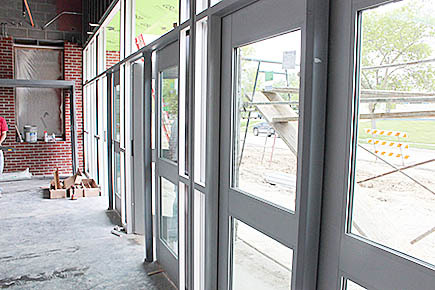 New entry doors were installed on the east side of the school addition last week.